Otherwise known as the elusive “Man Eating Chicken”. 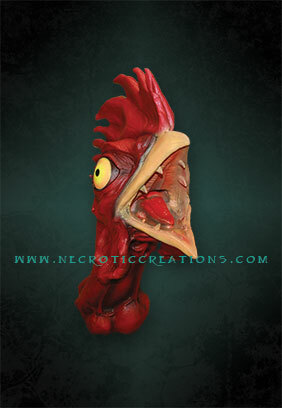 This prop was originally designed as a hand puppet but is now offered as a foam filled latex prop for your pneumatics. Everyone knows the sideshow gag. But little do people know that it’s real. Stripped to the basics, this mechanism is ready for any scene you have in mind. Made from high quality foam-filled latex and featuring a pneumatic armature manufactured by DC Props to Necrotic’s exacting specifications. Fits perfectly into any haunted trail, corn maze, or haunted hayride. Watch out… this chicken is foul! 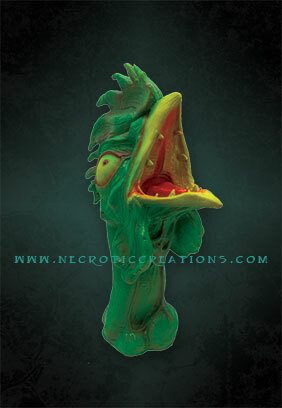 This highly detailed, hand-painted “Mutated Chicken” is ready to take a bite out of its victim. 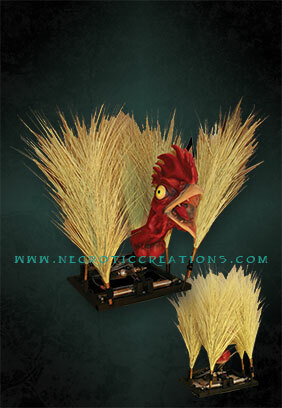 Made from high-quality foam-filled latex and featuring a pneumatic armature by DC Props manufactured to Necrotic‛s exacting specifications. Once activated, the weeds move to the side and the M.E.C. pops forward for the attack. It’s a perfect fit for corn mazes, haunted trails and hayrides. Includes pneumatics, controller, “Squawk” audio, and faux weeds. This isn‛t the colonel‛s chicken. Locked in a box, this highly detailed and hand painted “Mutated Chicken” is ready to break free to feed. Made from high quality foam-filled latex featuring a pneumatic armature manufactured by DC Props to Necrotic‛s exacting specifications. Featuring an internally mounted 4” 200w 4-ohm speaker to bring the Chickie to life. 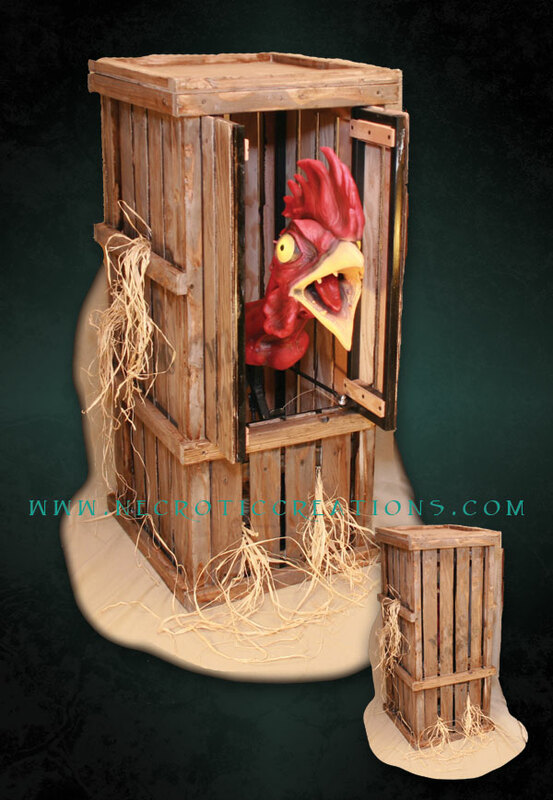 Complete with distressed wooden crate to blend into the oddest of carnival or circus sideshows. 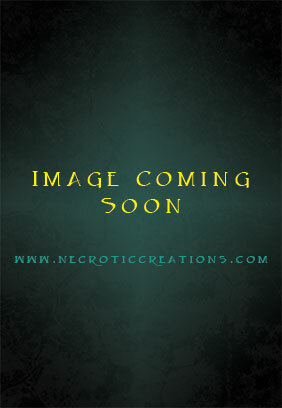 Man Eating Chicken Ready for Action, Coming Soon! This isn‛t the colonel‛s chicken.